that I purchased from a corner deli whose door could be entered from both streets. Doscher's French Chew Taffy (of Cincinnati), that Old Time Candy remarks is similar to Bonomo's Turkish Taffy, can be ordered here, or here, or purchased from many Cracker Barrel restaurants across the US (according to the french chew taffy site). Click here to watch a French Chew commercial. Another source of retro candy is Old Time Candy where you can also find a growing list of discontinued candy, inaccessible at this moment* (though recipes are not being destroyed, so resurrection may unfold at another time for another duration or interval of time (no permanence). AtRhymes.org, origins and history of this and other rhymes are offered. At Children's Books online, a 1904 version of Taffy, published by McLoughlin Bros, is a Mother Goose Gem (where you can listen to the rhyme or you can hear it here). 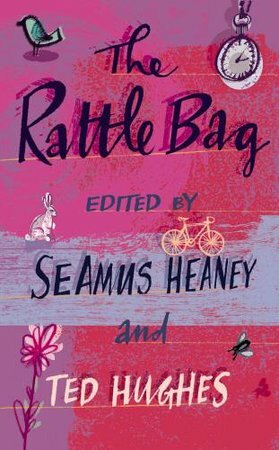 The poem is significant enough, for a complex system of reasons, for inclusion in The Rattle Bag, edited by two heavyweights of poetry: Seamus Heaney and Ted Hughes. Certainly, there's no expectation that nursery rhymes be polite or take into consideration civil, moral, or ethical perspectives. Taken literally, many point to a hard, often barely tolerable existence that did indeed parallel some of the harsh conditions of begone centuries; painted well is taffy-less existence, where though configurable, there was less opportunity or, in contexts so configured, necessity to play with perception. A kaleidoscope after all is a device that enables visual taffy (as does the kaleidoscope generator you can play with by clicking here). One ring game I played frequently until I was nine years old and my family moved to the outskirts of the city, Aunt Donna's Dead, was not a morbid game at all, even though the fun and imagination came from each child demonstrating a creative pose in which Donna died, a pose each child would mimic (a variation or taffy extension of this game is reported at Linda Hager Pack in the Appalachian Games section (interestingly, my father was from the Tennessee mountains as was his father and his grandparents) as Old Granny Wiggins Is Dead. The approach to death was actually healthy; in reciting the rhyme, there was an acceptance of death as a part of life; there was a willingness to take ourselves the pose in which a pronouncement of death was made. We didn't lament the loss of Donna; we weren't afraid of the corpse but used it as a mirror, as a temporary extension of ourselves, the game culminating in a dance. We were practically intoxicated with the taffy of death, the contortions we could imagine only as heart-stopping; in the way we died, we joined a grand dead circus. At bevnet.com, a Canuck praises the revival of Pepsi Lime in Canada, relates a story about company interest that Coca-cola took in response to a suggestion he sent to the company when he was in grade-school. He was heard; his opinion mattered, so perhaps, it's easy top infer, his contacting Pepsi about Pepsi Lime and Pepsi Vanilla has had some measurable impact. 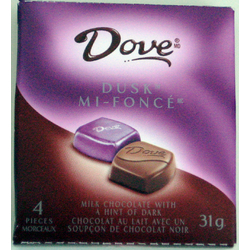 I contacted Dove chocolate (US) wondering whether or nor Dove Dusk (a blend of milk and dark Dove chocolate) would or could become available in the US, and my question was not met with the kind reception that David Canuck experienced contacting Goliath corporations. A terse reply: no. If you don't know Dove Dusk, try to find a way to introduce yourself to it. I now eat no other Dove chocolate. 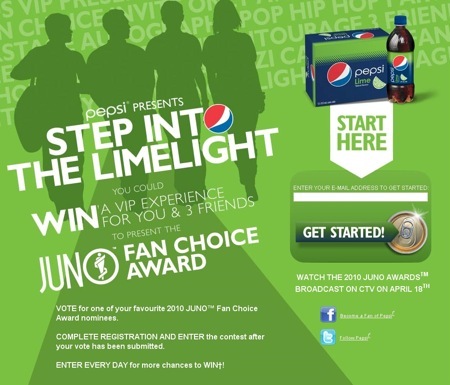 Pepsi lime of Canada sponsored Step into the Limelight, a competition for a chance to present the Fan Choice Award at the Juno Awards on 18 April 2010. Listentosoundsofthe Real Canadian Superstore on Walker Road in Windsor, Ontario from January 2010, mapped (recorded) as I walked through the aisles, eventually finding the Pepsi Lime display. Real Canadian Superstore (RJDJ Echolon in Windsor mix) was recorded using the iPhone built-in microphone and the free RJDJ application, Echolon sound scene that captures ambient audio and mixes it into the sound scene where Echolon scene and captured ambient audio interact and collaborate, stretching and folding into each other, making sonic taffy. Users of RJDJ are invited, even expected, to share their collaborative sonic works with the RJDJ community; there is no (as of this writing) direct save to iPhone interface; instead, there is an uploading to the RJDJ community interface. A parallel interactive audible world is built within the usual audible world, without disrupting that world. Additional space comes with that which needs that space. Indeed, the universe itself is expanding and accelerating, the space emerging as needed. Limits to injection of space into existing space are not known; the mind itself is able to expand to accommodate information without physical splitting of the skull. It is logical to assume that information is able to fold and loop and twist and fit, some of it relegated to compacted obsolete locations bypassed during most navigation of neural pathways.